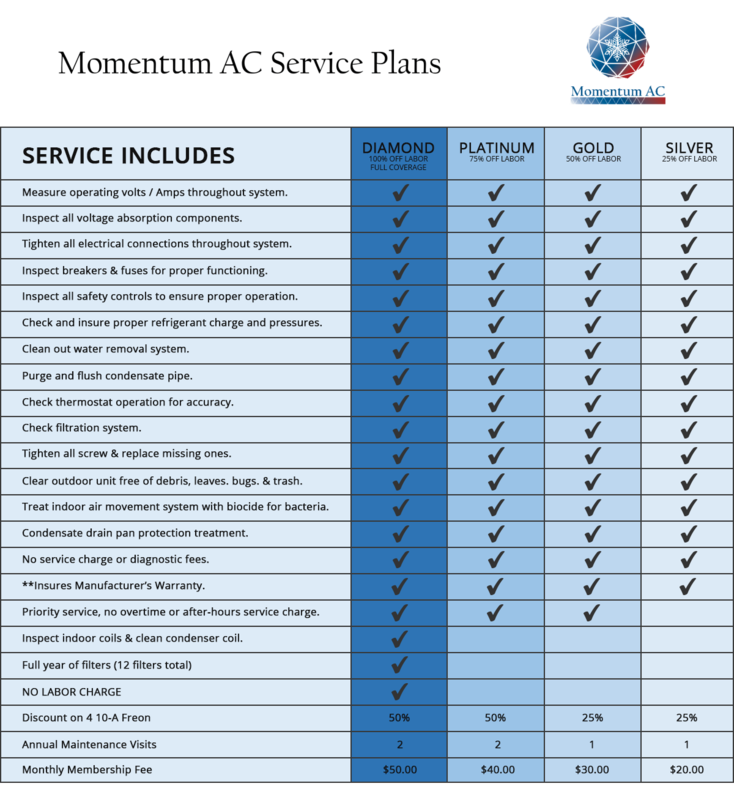 Momentum AC professionals are certified, qualified and trained professionals who use recognized techniques to clean, recondition and restore heating, ventilation and air conditioning (HVAC) systems. Having regular maintenance completed on your air and heating systems will not only ensure that they are running correctly, but it will also keep your systems running for years longer than they would otherwise. ** If the unit is out of warranty, the customer covers the cost of parts. ** Pricing is subject to change. Annual monthly price is per unit. Contract starts on enrollment date. Discounts available upon enrollment date. System or equipment must be properly installed, in proper working order. ** Customer may cancel at any time during the one-year term; however, any repair discounts received during this time period must be paid back before cancellation is completed. Any cost or repair maintenance required as a result of vandalism, misuse, acts of war, terrorism, riots, acts of God, (including lightening, or casualty such as fire or flood) is excluded. Any consequential damages as a result of maintenance or repair, or the necessity thereof including, but not limited to, damage due to overflow of water, mildew, fire, freezing pipes, shall be excluded form this agreement and shall not be the responsibility of the contractor unless due to contractor negligence or willful act of omission.